Jordan, the traditional custodian of the Al Aqsa Mosque, has rejected an Israeli court's decision to close down a building within the Al Aqsa compound. Palestinian and Jordanian foreign ministries say that Israel has no jurisdiction over the mosque. 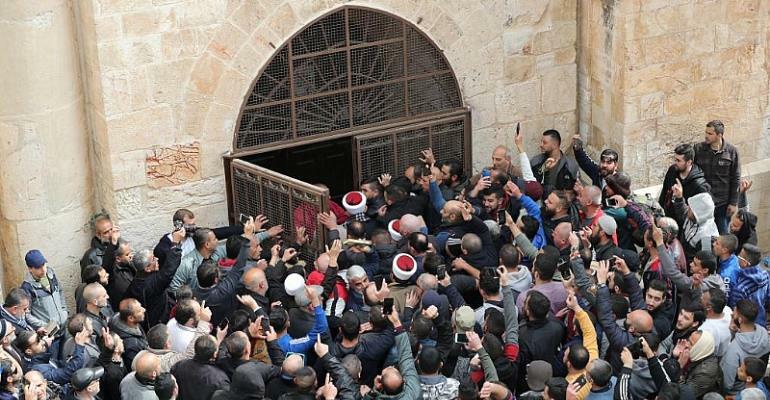 The Gate of Mercy, Bab Al Rahma, has been closed down for 16 years due to Israeli claims that a Hamas-affiliated militant group held meetings there. But Al Aqsa custodians argue that the group disbanded and that there is no political activity taking place within the compound. On 14 February, the Waqf Council opened the Gate of Mercy to Muslim worshippers. But, on various occasions, Israeli police prevented Muslim worshippers from entering the Gate of Mercy resulting in a confrontation and subsequent arrests. Mahdi Abdul Hadi , a member of the Islamic Waqf Council in Jerusalem, was reportedly interrogated by Israeli police on 1 March and banned from entering the Al Aqsa site for one week. “This is military occupation by the gun and the bullet. They have been controlling our lives for the past 50 years,” Abdul Hadi told RFI. The Israeli Court has given the Jordanian-appointed Waqf council a 60-day deadline to respond to its decision. “They gave us two months because they want to postpone any decision after the Israeli elections, after the 9 April, after there is a new government and new policies. For the time being, they want to give the upper-hand to Netanyahu,” Mahdi Abdul Hadi explained. Zuhair Sanduqa from the Palestinian National Council regards the Israeli court's decision as provocative. “It's a provocation against our rights, our land. We have been living here, in Palestine, for more than six thousand years," he exclaimed. East Jerusalem and the Al Aqsa mosque are occupied territories. Jordan says that according to international law and United Nations resolutions, they cannot be subject to the Israeli judicial system. According to Mahdi Abdul Hadi, there are several reasons why the Israeli court felt it could defy international law. Israel's Prime minister Benjamin Netanyahu wants to attract the right-wing vote for the general elections. According to him, such voters want the Al Aqsa mosque to be a site of devotion for the Jewish community. Jews are allowed to visit Al Asqa but cannot pray there. There is no real support in the Arab world for the Palestinian cause to pressure Israel to respect international laws, he says. There has been a lack of concerted effort from international organisations such the United Nations, the European Union, to hold "a real serious position to contain Israel's agenda vis-a-vis Al Aqsa." Zuhair Sanduqa says that, as it stands now, the matter should be taken to the United Nations Security Council. “They are occupying us. They have the military force. They have settlers who are armed. We cannot prevent them from doing [what they are doing] by force,” adds Sanduqa. For Sanduqa, diplomacy could stand a chance if there is no American veto. “If they [Israel] face great pressure from America itself or the international community, there might be a chance. But if they are sure no one will pressurise them, they will do nothing. For Mahdi Abdul Hadi, the situation can be resolved if Israeli police leave the Al Aqsa site. “Then, people will go and pray normally. There will not be any clashes or confrontations. Israel has to respect the status quo and not allow the Jewish fundamentalists any right on the site, who claim that they want to build a synagogue on the site," he added.